Rapini is an interesting vegetable. From Wikipedia, Rapini has many spiked leaves that surround a green bud which looks very similar to a small head of broccoli. The flavor of rapini has been described as nutty, bitter, pungent, and 'an acquired taste'. 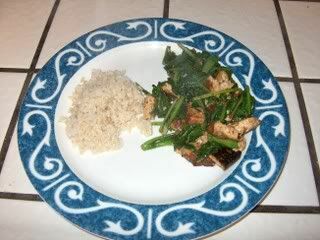 Last night, I made the Spicy Stir-Fried Rapini with Lemon-Basil Tofu. I made one major adjustment to the recipe, which was to leave out the red pepper flakes – hence, it was actually Spicy-Not-So-Much stir fried blah blah blah. It was awesome. I could have just stood over the pan eating the tofu – and I’m not generally all that excited about tofu. I also did a pricing experiment. I went online and attempted to replicate my order from Planet Organics at Safeway – which is the only store in town which carries organic anything. The cost was approximately 20% less at Safeway…but only half of the order could be filled with organics. The actual price difference organic-to-organic was about 5% higher for Planet Organics; it was when I filled the rest of the order with “whatever you’ve got” that the price difference accelerated – dramatically. The shipping charge I pay for Planet Organics is $4 less than Safeway – while it’s kind of dirty pool to count that (since I could, in theory, haul my lazy carcass down to the supermarket and avoid that charge at Safeway), it all but eliminated the price difference. There was one other thing brought to my attention by the nice lady who runs Planet Organics: The prices spike in the winter and then begin spiraling down in the spring. The boxes in winter are fairly sparse, but at the peak of the reaping season they’re so heavy the delivery guys risk hernias wrestling them out of the trucks. Well, duh. It’s another interesting facet to the experiment: This is old-school market economics at work, and the perishable nature of the goods make it even more aggressive than things like shoelaces. When you’ve got fresh vegetables going to market, you can’t sit back and wait for supply to falter so price can go up – you’ll be left sitting on a pile of fresh compost. By the same token, those of us who are fed up with flavorless food picked well before its prime so it can survive a thousand-mile journey from whatever point on the planet is currently enjoying spring are going to be arm-wrestling (wallet wrestling?) with other like-minded individuals over a pretty small supply of same. It’s funny what a role food has suddenly taken in my life in this last year. I mean, obviously, I ate food a lot before this year. And I have always (well, in my adult life – my Denizen’s theatrics have nothing on mine as a child – I believe I actually did subsist on grilled cheese sandwiches and cheeseburgers for about eight straight years…) appreciated fine dining, and appreciated no, really, it’s fresh produce and so forth. But in this last year, as I’ve been forced to pay attention to the fat and sodium and what-all-else is in my food, I have really started noticing just how…well, frankly, in a word, bad, our supermarket fare really is. I’ve been smothering the veggies in sauces and butter and salt, adding flavor and even texture to them because the poor little things, they needed help. I have to say, every single thing in that box from Planet Organics has been delicious. It’s the way I remember things tasting, from the oranges to the carrots (oh lord…I still cannot keep my face out of that carrot bag, and it really is getting embarrassing – I think my skin is actually starting to turn a little orange, people…). Even the Denizens noticed the apples tasted better…Eldest said it tasted ‘brighter’, which tickled me no end. Still not paying $12 a pound for asparagus, though. It just came into season, and peaks in April – I suspect that’s when I’ll start enjoying it! Thanks for the breakdown on the price difference...I had a feeling they wouldn't be selling the organics for that much of a premium. I think I want to try organics for us for a while...now all I need is to find an organic delivery service around here! Because yours (oddly enough) does not deliver to South-by-God-Carolina. On the other hand, spring is coming soon and I can start looking for organic farm stands around here. Oh, and I think rapini sounds delicious, the tofu not so much. I want to try it though, because after the gastric bypass I'm supposed to be getting way more protein than I am, and a girl can't live on cheese!